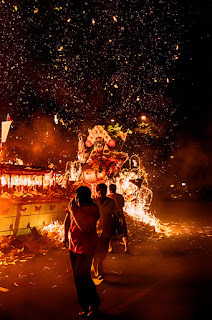 Hungry Ghost Festival - Are you hungry tonite??? 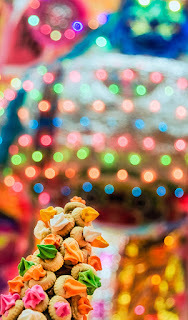 The Hungry Ghost month is coming to the midpoint, so I am sure some of you would have seen the stage and altars on the roads or even the joss-sticks and candles stuck on the roadsides. 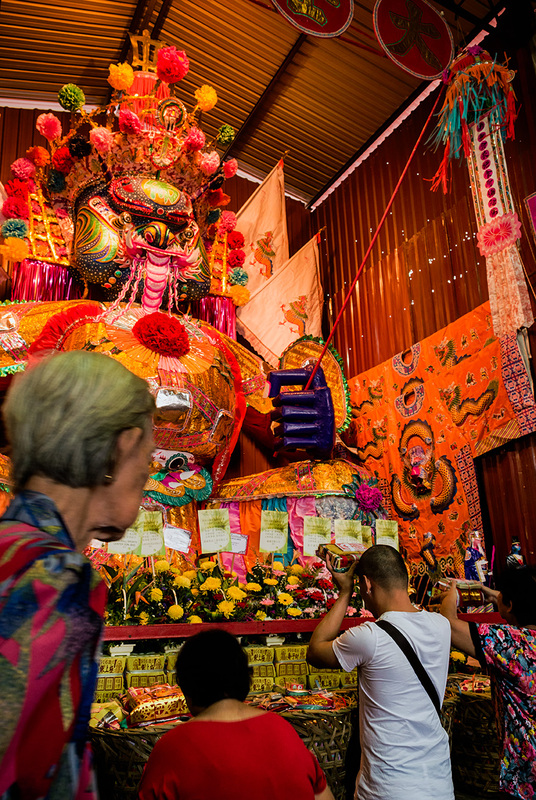 The Hungry Ghost Festival is a mixture of ancient folk believe, Taoism and Buddhist practices that is amalgamated into this hodgepodge of rites, rituals and superstitions, especially by the South-East Asian Chinese diaspora. 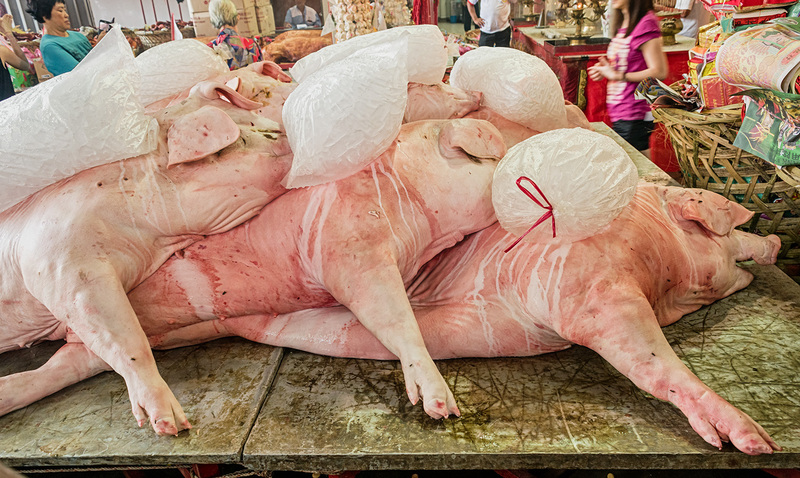 Hungry Ghost @ Bandar Baru Ampang - food offering to the King of Hades. Hungry Ghost @ Bandar Baru Ampang - empty row of seats in front of the stage. 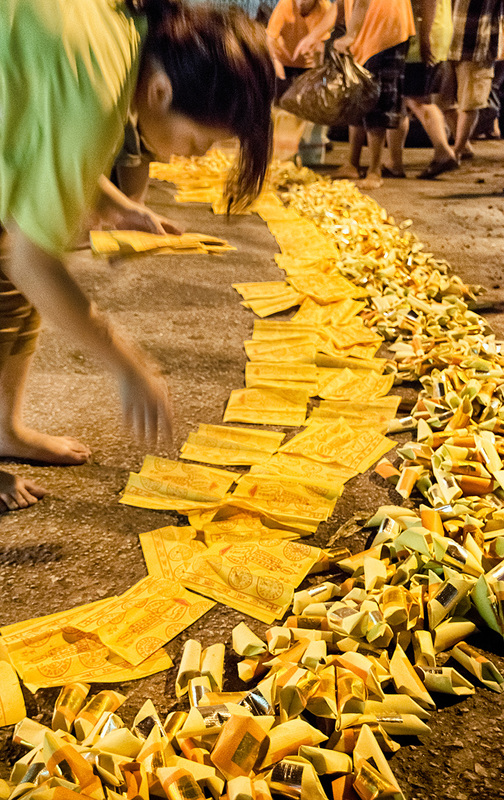 They are provided a stack of joss-paper money and an orange as a show snack. 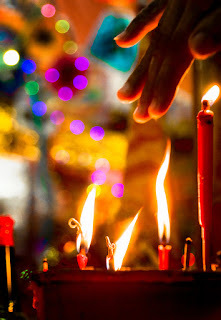 Hungry Ghost @ Bandar Baru Ampang - candles and other items on altar table. 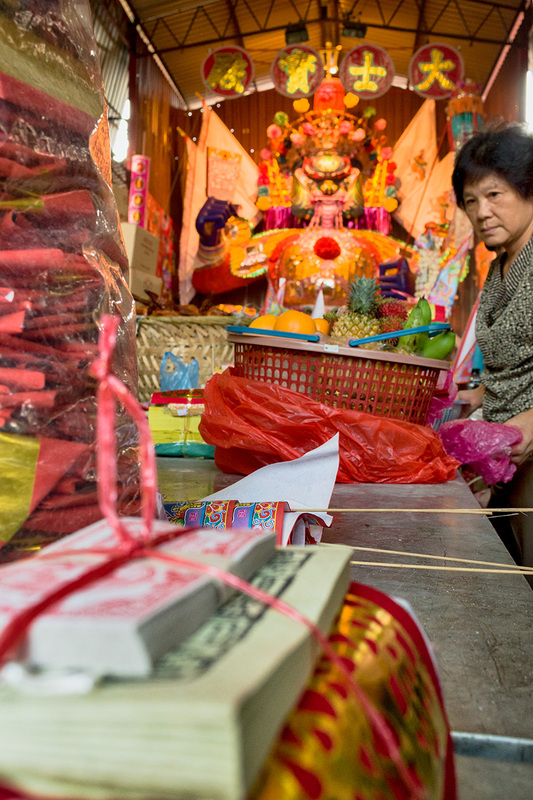 The Hungry Ghost Month is the 7th month of the Chinese lunisolar calendar. The Chinese believed that ghosts are let out of Hell to roam the Earth on this month. Hence the staging of Chinese operas as well as shows called ge-tai or go tai to provide entertainment to the spirits to prevent mischief. Whilst the show is meant for the wandering spirits, it doesn't mean that humans do not enjoy the show. 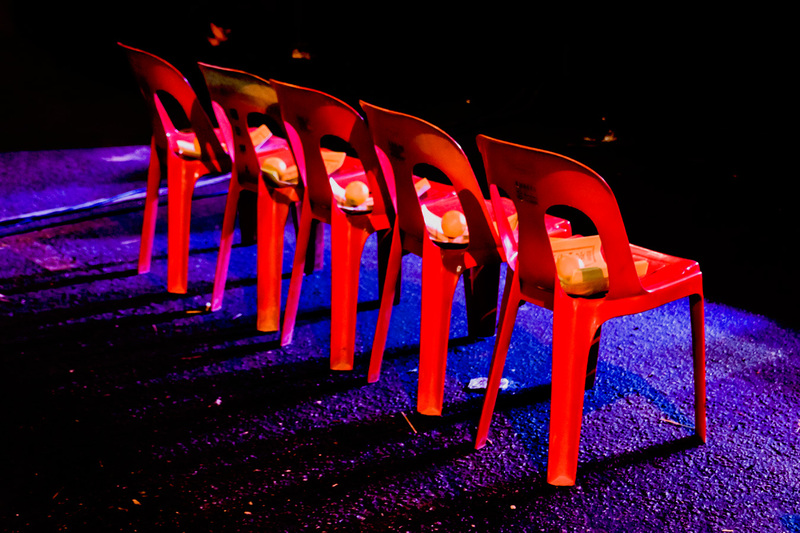 However, the first row of seats are always reserved for the spirits, also called 'good siblings/brothers'. Hungry Ghost @ Bandar Baru Ampang - sending off the officers of Hell. 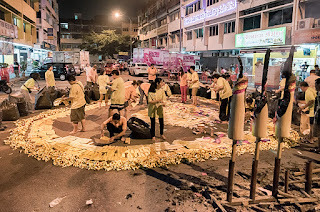 Hungry Ghost @ Bandar Baru Ampang - burning off the King of Hades paper effigy. To control the wandering spirits, the officers of Hell will also come up and set up a 'temporary' court. Hence a large shelter housing the paper effigy of the King of Hades and his assistants are erected to ensure safety of the people. 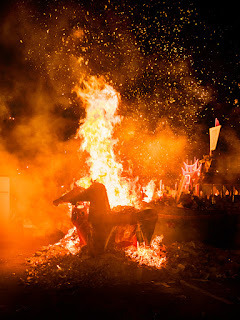 When the 'entertainment' is over, the King of Hades and all of his officers will be burnt in a big bonfire as to send them back to their original office. Hungry Ghost @ Bukit Mertajam, Penang - Beautifully crafted paper effigy of King of Hades. Hungry Ghost @ Bukit Mertajam, Penang - Besides roasted pork, duck and chicken, there were also raw pork and goat on the table! Paper and food offerings are given, both to the wandering spirits or hungry ghost, as well as to the deities in charge of the proceedings. Elaborated stacks of food, cakes and fruits are often placed on the altar table to the King of Hades, and superstition has it that nothing that is not intended as offering are to be placed on that table, for once something is placed on it, it is considered an offering to the King of Hades and his retinue. Hungry Ghost @ Maluri, Cheras - Laying down joss paper to make a circle for the big burning off. Hungry Ghost @ Maluri, Cheras - that is a lot of work to make the bonfire base. Hungry Ghost @ Maluri, Cheras - Here in Maluri, a medium in trance is in charge of the send-off proceedings. He inspects the circle and gives the green light to proceed. 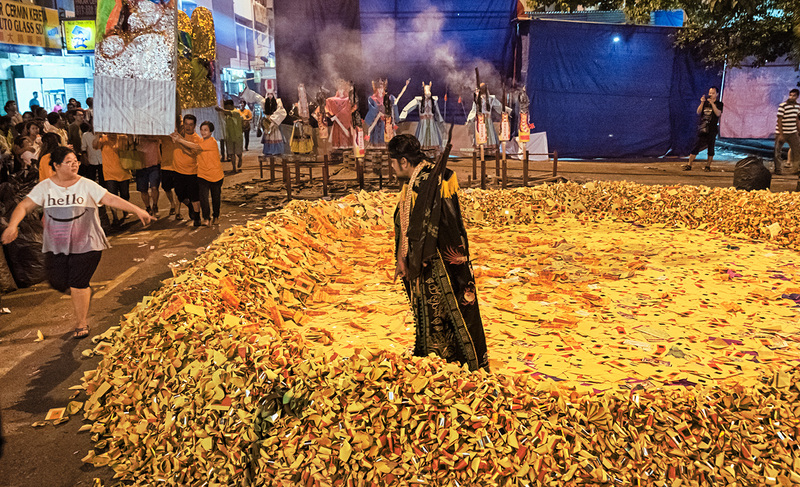 Depending on the location, the entire procedure of the setup, worshiping and send off for the King of Hades can be overseen by Taoist priest, syncretic Taoist/Buddhist priest or spiritual mediums channeling a particular deity. Thus different locations will give you variations to the entire procedure and can be very interesting to watch and compare.